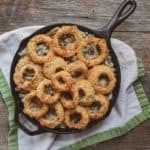 Vegan Green Bean Onion Ring Casserole. Made with Shane & Simple Creamy Vegan Mushroom Soup and Crunch Oven Baked Onion Rings. Easy, filling, manly, hearty, healthy, and BIG TIME DELICIOUS! Preheat oven to 450 degrees so you can make onion rings. While oven is heating up, make sour cream and mushroom soup then set aside. Next, make the onion rings according to recipe on Shane & Simple. Once they are finished, remove from oven and set aside. Decrease heat on oven to 350 degrees. Combine green beans, entire recipe of mushroom soup and sour cream into large bowl and mix well. Pour mixture into a large baking dish or cast iron skillet and bake in oven for 10 minutes. Remove from oven, top with cooked onion rings, and bake for another 5 minutes.